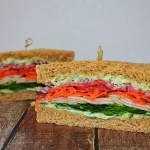 I have been wanting to try an all vegetable sandwich for awhile now. I love how colorful it was and how the flavors complimented one another. I made an avocado mayonnaise using just Vegenaise and a ripe avocado. 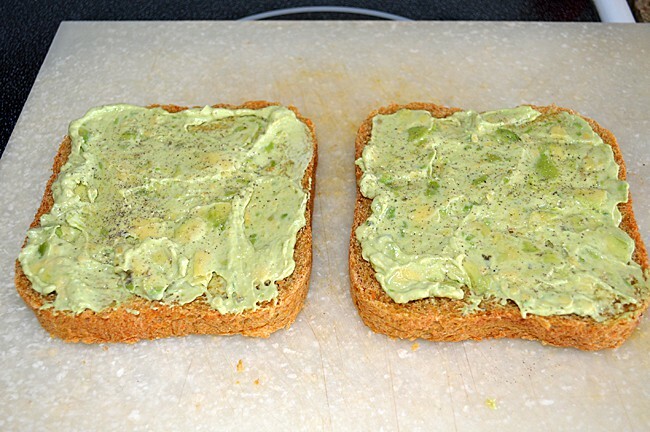 I must be honest…this was what made the entire sandwich come together. Paired with the red onion, the sweetness of the pear slices…it was pure perfection. 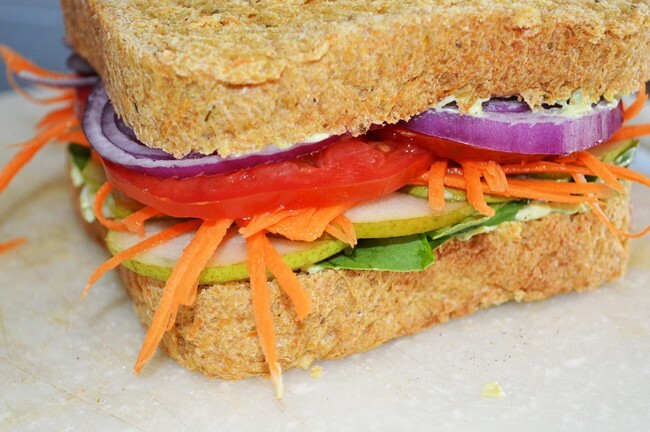 You could really adapt this sandwich to ingredients that you like. 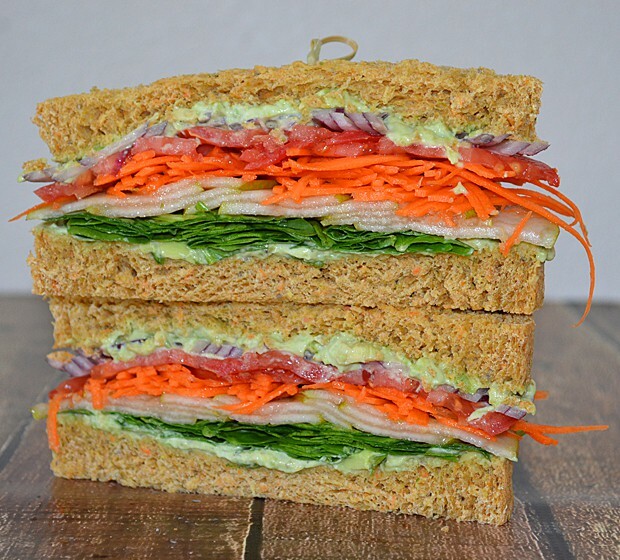 Here’s how we layered it up… First, it’s one avocado to 1/4 C of vegan mayonnaise. I left it chunky. Season with salt & pepper. 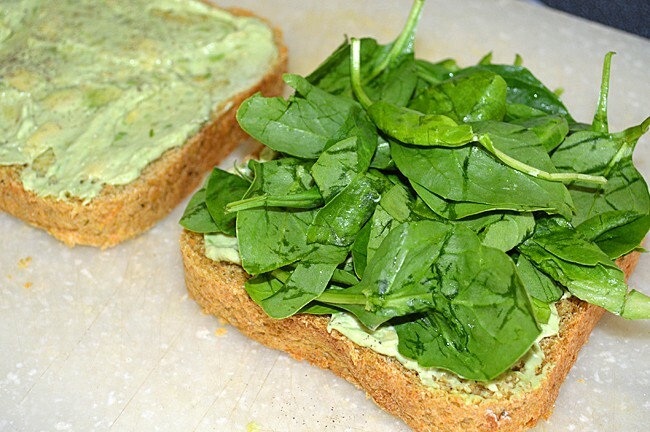 Then a nice, thick layer of fresh spinach! My favorite addition…thinly sliced pears. I know what you are thinking. But trust me on this one! Just wash it well and slice it thin. It adds such a nice level of sweetness. Press down slightly. Up next are very finely shredded carrots. Thinly sliced tomatos. Heirloom tomatos would be really nice here. Don’t skip this one! Very thinly sliced red onion. You could certainly use less of them. Once you put the top on, give a press. It gets to be quite a large sandwich if you don’t. Also, this will help keep it together better as you eat it. Isn’t it just…pretty to look at? 🙂 I must say, this ones a keeper in my family. I could eat this at least once a week. 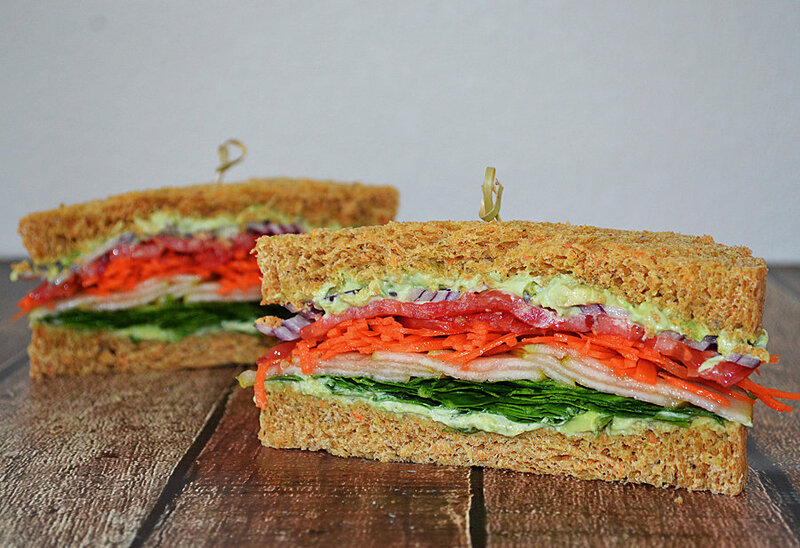 The best part is that other than the bread, avocado and vegan mayonnaise…there are very few calories so you can pile those veggies high! For the bread, add the ingredients in the order listed. Choose the "basic/white bread cycle" on a light/normal color setting. The bread machine will do the rest! -Proof the yeast (dissolve the yeast and the 1 tablespoon of sugar in warm water, amount will depend on the recipe). -Combine the ingredients and mix well. -Knead the dough until smooth and soft. -Punch down, and shape into a loaf. -Place bread in a greased loaf pan, or on a baking sheet for a round loaf. -Bake, as most bread is baked in a moderate oven, about 350 degrees F (175 degrees C) this is a good temperature to start with. -Bake for 40 to 50 minutes (this will depend on your oven and the bread itself so be careful here), or until the crust is golden brown and the loaf sounds hollow when tapped. The baking time may vary slightly. 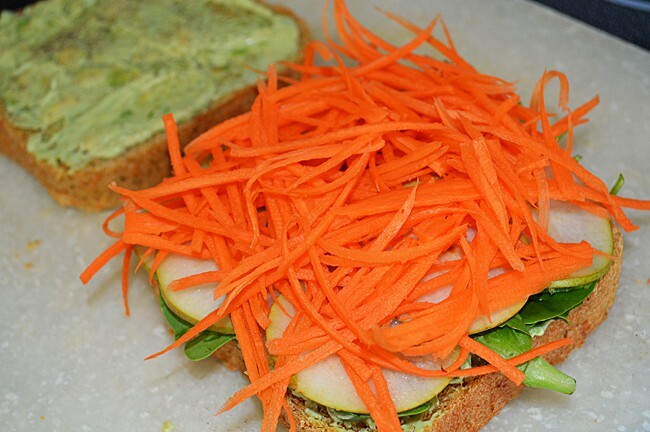 To assemble the sandwich, using our Zucchini/Carrot Bread or your favorite loaf, slice medium to thick slices. Combine the avocado and vegan Mayonnaise, leaving it semi-chunky. Spread one half on each slice. Next, a layer of spinach. Press lightly. 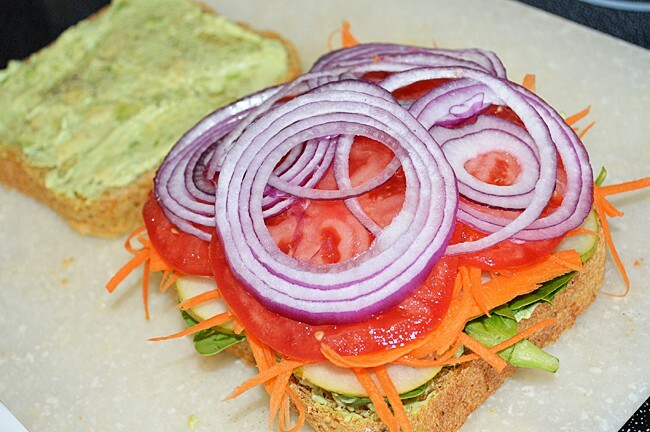 Add a layer of thinly sliced pears, then shredded carrots, thinly sliced tomatos and finally, red onion. Top with the other half and give it a good press. 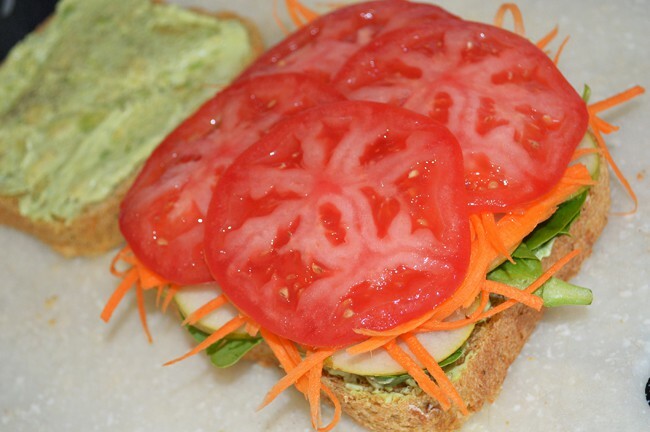 Serve with your a pickle and your favorite veggie chips! 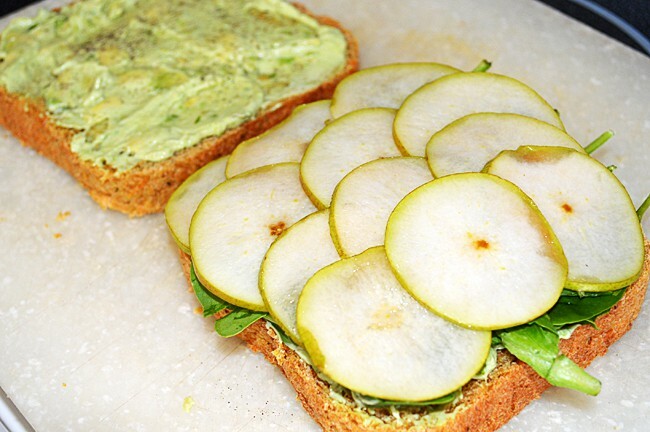 The pear slices look like vegan turkey slices at first glance! Nice idea.